Mental Health - Moral Reconation Therapy - MRT® distributed exclusively by Correctional Counseling, Inc.Moral Reconation Therapy – MRT® distributed exclusively by Correctional Counseling, Inc. Mental Health - Moral Reconation Therapy - MRT® distributed exclusively by Correctional Counseling, Inc. The mental health workbook, Discovering Life and Liberty in the Pursuit of Happiness, is used in all treatment settings, including substance abuse offices, mental health centers, day treatment programs, intensive outpatient, residential psychiatric hospitals, educational settings, private practice, and in a variety of criminal justice settings. 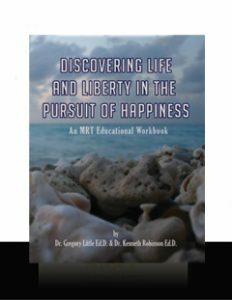 Discovering Life and Liberty is a mental health workbook based on the core principles of Moral Reconation Therapy – MRT®. It includes 16 steps, with 12 of these typically completed in 24-26 group sessions. Clients complete workbook homework prior to coming to each session. In the group, clients present their homework and the facilitator passes the client to the next step — or directs the client redo the homework based on objective criteria. All MRT groups are open-ended, meaning that new clients can enter an ongoing group at any time. Each group session usually has new clients, as well as some finishing the program. MRT training is required for CCI’s mental health workbook, Discovering Life and Liberty in the Pursuit of Happiness.